The end of the Great Depression offered Americans a new beginning. Part of that beginning brought the transformation of newspaper cartoons into fully-fledged comic books. When the first Superman comic launched in 1938, it brought with it a new era called The Golden Age of Comics. Although fans dispute the precise dates, most recognize it began at the end of the 1930s and continued until the 1950s. Golden Age comics catered to a nation who had survived a decade of austerity and were not on the global stage fighting a world war for the second time in a century. These comics offer inspirational stories that allowed good to triumph over evil. They were cheap, easy to share, and entirely patriotic. The superheroes who graced the pages of these comics began to lose steam in the 1950s, giving way to Westerns and science fiction. However, these comics are now some of the most valuable on the market. Values change with regularity, but many of the top contenders remain the same. Do you know what the most valuable Golden Age Comics are? We’ll show you the comics with the highest price tags and what your collection might be worth. Some choose to order their comics according to rarity or popularity, but we listed our comics according to one factor alone: cold, hard cash. 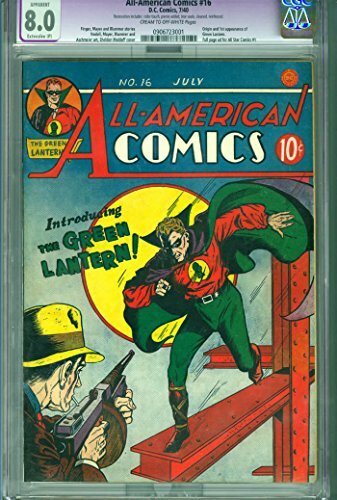 The list below contains the most valuable Golden Age comics according to the highest recorded sale price. Why did we choose record sale prices? Because Golden Age comics fetch a price like no other. Only around ten percent of the initial print circulates today, primarily through the hands of private collectors. Additionally, the original number of printings was small, and the paper used meant that many disintegrated over time. Then, you consider the way original owners handled these treasures. They cut them up, drew on them, tore them apart, and tossed them into book bags. To find a copy that survived the initial owner’s excitement is a rarity in itself. Think you know what the most valuable comics from the Golden Age are? Think again. Here are the most expensive comic books every sold according to the most recent data. Action Comics #1 tops every list because it sold for the highest price tag of any comic book ever in August 2014. No other comic book broke the $3 million threshold before that day, and as of 2018, no sale tops it. Why is Action Comics #1 so expensive? Superman and Lois Lane made their first ever debut within its page. It’s the comic book that started all comic books. When Action Comics #1 hit newsstands in June 1938, it arrived on a run of 200,000 copies. Over the last 80 years, almost all disappeared or suffered from age. Only 50-100 of the original series remain, and few feature a sell-able condition. Even the most dedicated collectors are unlikely to ever see an original print of Action Comics #1 much less own one. But its rarity sells it. What’s the lowest price available for one of these prints? Expect to see a value of at least $75,000. In May 1939, Detective Comics introduced a new character who would live for nearly a century. Detective Comics #27 was Batman’s debut, and the combination of the first appearance with the rarity of Golden Age comics adds to its value. The record selling price for an original print of this comic is $2.1 million. The minimum value sits at $70,000. A customer bought an original copy of this December 1941 comic for $936,000. The deal went down on eBay, and the customer bought it from Pristine Comics. Pristine is also the seller who arranged the $3.2 million sale of Action Comics #1 back in 2014. Do you have a first-edition copy of Wonder Woman’s origin story? Some suggest that the approximate value of a “very fine” print of this comic is worth a minimum of $31,500, but a mint copy could fetch over $100,000. Eleven months after Batman arrived on the scene in Detective Comics #27, the legendary hero met his match in Batman #1. The April 1940 comic featured the introduction of the ultimate archnemesis: Joker. It also introduced a character who would go on to dominate her own series — a little character called Catwoman. An issue of Batman #1 sold for a record $567,000. Your copy may sell for a minimum of $12,000. Superman #1 deviates from almost every comic on this list because it isn’t a first appearance. Instead, the pages detail Superman’s first solo outing. The highest recorded sale of Superman #1 is $507,000. Own a copy? It likely features a minimum value of $15,000. Flash Comics #1 falls in line with the other high-value comics. It records both the origin story and first appearance of three important comic characters: The Flash, Hawkman, and Johnny Thunder. The comic boasts one of the highest ever recorded sales at $450,00. However, its minimum sale value is significantly less than other comics at only $5,000. The creep of Sensation Comics #1 into the list of the most valuable comics of the Golden Age is a testament in part to Gal Gadot’s portrayal of Wonder Woman. Fan’s newfound and rekindled love affair with the adventures of Woman Woman fuelled three of her comics to reach the top ten most valuable Golden Age comics — more than any other character. Additionally, it is one of only two comics on this list that doesn’t feature the original debut of a character. Sensation Comics #1 is Wonder Woman’s second outing. It was, however, her first comic cover, which lends to the value when combined with the rarity. A copy of this comic sold for a record $399,000. The minimum value is quite low. It sells for around $5,000 as a baseline. Captain America Comics #1 hit newsstands on March 1, 1941, and it introduced readers to a character who would resurge seventy years later in a blockbuster film. The comic’s plot also happens to be Captain America’s debut. Captain America would become the quintessential America hero — a savior wrapped in the American flag and poised to punch Hitler. Although the comic originally retailed at $0.10 a copy, the importance of the issue meant that one well-kept copy would sell for $306,000. The placement of Wonder Woman’s official debut before her second adventure and cover story is a curious one. It is, however, her first solo comic and tells her origin story. You’ll also notice that this is Wonder Woman’s third entry on our list. Published in June 1942, Wonder Woman continues to resonate today as her fame only continues to grow. Do you have a copy of this comic? Estimates value this edition at around $1,500 as a minimum. Most issues of the All-American Comics series sell for a tidy sum on the market. Though it is the tenth on this list, these comics, including #16, tend to be scarce, which drives up the price of even a low-quality condition. All hail the Green Lantern, who All-American Comics debuted in issue #16 in July 1940. A copy of this unforgettable comic sold for $203,000. Those who have a copy in their possession may sell up for as little as $3,000 even for a poor but complete copy of the comic. Do you have a copy of these Golden Age Comics? Do you have the cash and want to invest in one of these valuable pieces of art history? We put together a guide that caters to both buyers and sellers. You’ll find that what benefits buyers also benefits sellers because it ensures a smooth transaction with prices that match the value of the pieces. Whether buying, selling, or sitting on an inherited collection, the storage of comics directly plays a role in their value even if you have no intention of letting a single piece go. If you’re new to comic collecting, know that storing your issues doesn’t need to be tedious but can be specialist. You’ll need a comic book board and bag for every single comic you intend to protect, which should be all of them. While you can buy polypropylene, polyethylene, or mylar bags, consider sticking with the third for any comics of value or potential value. Note that Wonder Woman comics became more valuable after the blockbuster films, so even if you don’t think your collect carries much weight, Hollywood could change your mind. Mylar bags last a lifetime. They are thicker and made of safer material than either of the poly bag types. However, you must also use them carefully because thick mylar material can create tears in the cover of pages of your comic book. Not interested in mylar bags? Polyethylene is your next best option. These bags are more durable and let in less light than polypropylene bags. Expect to change these an average of every eight years. Don’t forget to choose an acid-free comic book board. Any board not marked “acid-free” will damage the paper over time. To put all the components together, you’ll need a gentle touch to avoid any damage. You can slide the comic in first and then slide the board in behind it. Switching the order also works for some. Many find it easier to put the board in first and then the comic because the method provides more control. Finally, be sure to store your comics somewhere with a constant temperature, low light, and little moisture. Consider putting the sealed bags into comic book boxes before tucking them away into storage. Comics are notoriously hard to value, particularly when you try to shift a whole collection. Comic books offer the most value when stored correctly and are in good condition. Proper storage also makes it easier for evaluators to see what you have and ballpark what you might get for them. You should have an idea of what you want for your comic or collection. Supplementing your estimate with a professional appraisal is often worth the money. A professional might tell you that you overvalued your comics, but they might also warn you that you undervalued your collection. A professional appraisal also gives you armor in negotiations with buyers. If you’re new, to selling comics, your local comic book store is a great place to start your journey. It’s by far the fastest and most convenient way to shift your collection. Your local store provides cash on the spot, but you might find they won’t offer the best price compared to private buyers. However, your store may surprise you, and they may connect you with someone who is looking for exactly what you offer. Selling online is also easy, but if you’re new to the world of comic book trading, then you might find the process tedious. You’ll find plenty of tire-kickers on Craigslist, eBay, and sites like Reddit, but you’ll also find a global audience. If you want to sell Golden Age comics, then there’s a greater likelihood that the value of the transaction will be higher. In these cases, it may be worth getting in touch with a comic book broker. A broker takes a commission from every sale. However, they also open up connections to big comic investors facilitate transactions that you might not have the expertise to complete by yourself.